(April 8, 2014 – Beverly Hills, California) Work in the film biz? Or want to? Or make indie films? Or shoot corporate video? Have an iPad? Since all images, not matter what they are being captured on, must go through a lens, and since light has a direct effect on colour — or color as our friends south of the border misspell it — the issue of getting the colour right has been a problem since movies more or less stopped being black and white. But even black and white movies have colour issues. Thanks to the Academy of Motion Picture Arts and Sciences (AMPAS) the job of getting colour right just got a whole lot easier and best of all, it`s free. It`s called the Academy Color Predictor and it is the first app created for the general public by the Academy`s renowned Sci-Tech Council, more specifically the council’s Solid State Lighting Project Committee. Available now on iTunes, the free app is designed to work on the iPad iOS 7. It will be one of the highlights of this week`s 2014 NAB Show in Las Vegas. Basically, and wonderfully, the app helps filmmakers predict the interaction of the key ingredients in cinematography: the lights, camera, filters and the photographed objects themselves. 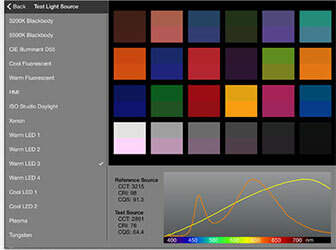 Users can change key source light, image sensor and filter parameters to instantly visualize color rendering differences and compare different combinations of elements. Click here to find the free app on the Apple iTunes store.